"Annie Hall" captured the Oscar for Best Picture of 1977 amidst stiff competition from "Close Encounters of the Third Kind," "Saturday Night Fever" and "Star Wars." Seatle Slew won the Kentucky Derby; Portland beat the 76ers in the NBA Playoffs. Elvis Presley died that year, as did Bing Crosby, Charlie Chaplin, Groucho Marx and Vladimir Nabakov. All of that news was almost overshadowed by the Postal Service's request to raise the cost of a first class stamp to 13 cents. And, most empathetically, recently sworn in President Jimmy Carter pardoned Vietnam War conscientious draft resistors. The first fine Vietnamese cuisine was introduced to Philadelphians in 1977 by Ha Nguyen, one of this city’s most beautiful and talented proprietress-chefs. She had opened “Saigon” as a cramped store-front restaurant at 933 Washington Avenue, which, pound for pound, served the best Vietnamese concoctions in the city. Nothing but a neon sign proclaiming "SINCE 1977," and a jutting vestibule, differentiated its façade from neighboring row houses. 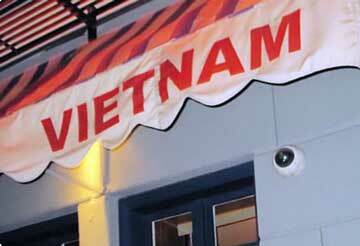 “Saigon” closed more than a decade ago. “Vietnam” was opened by the Lai family who, with eight children had fled Vietnam in 1978, spending months thereafter in a refugee camp. After finally gaining entrance to the United States, the Lai’s spent years of back-breaking work in the grocery business. In 1984, they finally opened their own noodle-laden restaurant in Chinatown. Vietnam’s simplicity and authentically Asian folksy menu catapulted it over any other such fare. Urban dwellers immediately crowded around the fragrance and frankness of such a homey cuisine. It has now become, through renovations, expansion and entrepreneurial innovations by young son Benny (and now daughter Tina), the most cherished charcuterie for premier classic Vietnamese taste buds. 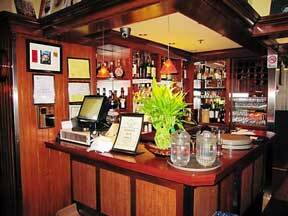 Sharing is a necessity here, so anything you order will undoubtedly serve two voracious appetites. 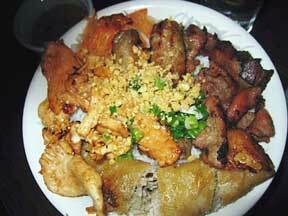 Begin with Hoanh Tanh Sup ($7.50), Goi Cuon Rolls ($6.50) and Tom Nuong Xa Skewers ($10.95) for the table. Everyone gets extra bowls and plates, chopsticks, ladles and forks. 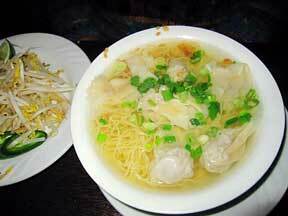 The first aforementioned “Sup” is golden Wonton Soup, a steaming, glistening double-oversized serving, brimming with cumulus clouds and plump pillows of wontons. You are bowled over! Its aroma arises naturally from simmering shrimp and pork-filled silken dumplings. Freshness permeates the brew so that Southeast Asian spriteness translates to heartiness. A side dish full of bean sprouts is meant to be bathed in the broth to add crunch. Slices of lime and rounds of hot green peppers circle the sprouts. (The latter are to be avoided unless you adore a reticulated python’s snakebite on your tongue.) Devour the liquid with the aid of clasped chopsticks, tilting one end of your bowl in the air just above your lips while pushing all contents between them. Your mouth becomes scented by the chopped scallions dancing in the delicately housed scantily clad dumplings floating throughout. Underlying egg noodles are slurped at will. Close your eyes and your thoughts are simulating synchronized swimming routines. Goi Cuon Rolls are two perfectly presented rice paper wrapped purses of see-through thinness, whose ingredients are deliciously opaque, bulging with pieces of shrimp, pork, basil leaves, bean sprouts, and rice noodles. A stem of long lemongrass pokes and peeks at you from the roll’s folded innards, assuming you can use its sturdiness to carry the roll as if it were a taffy. Dark brown peanut sauce is nearby for dipping. Nothing is fried; all is submitted at room temperature so that the feeling of fresh natural exuberance is omnipresent. The rolls simply hug each other, and your sensibilities. 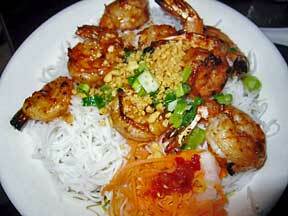 Finally, the Tom Nuang Xa Skewers are large charred shrimp served with hatch marks, craning over white rice. The demarcations are helpful for dividing the shrimp into bite-size pieces. The body of each is moist and crispy. Swallow with accompanying shredded pickled carrots and strands of snow-white Vietnamese pasta. Melodies of mellowness caress your sinuses with darkly grilled sultry smokiness. Chili oils are concurrently presented for dousing. I cannot tell just one Lai, nor remain silent about the truth concerning the House Special Vermicelli, Bun Dac Biet ($13.95) It is all you shall need to complete your meal. 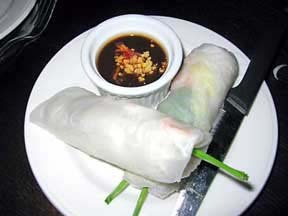 It includes plentiful (a) Crispy Spring Rolls which are quartered into pieces almost ready for the widest oral opening. Stuffed with ground pork, sautéed onions, mint, mushrooms and blends of Asian spices, you must stretch your jaws to accommodate the crispiest memorable morsels; (b) Grilled Meatballs, the length of a stubby half-smoked Churchill cigar, smelling only of garlic and ground meat; (c) Char-Grilled Chicken and Pork displayed as flat long slices superbly doused in oils and then drenched in salacious seasonings and sauces; (d) all of which are cavorting over voluminous, voluptuous Rice Vermicelli Noodles sprinkled here and there with crushed auburn peanuts and chopped green scallions. The defenseless rest.